The Global Social Observatory (GSO) concluded its operations as a non-state actor based in Geneva, Switzerland with a “celebratory” interactive dialogue on Tuesday, 19 December 2017. The GSO mission has been to facilitate an inclusive dialogue in a neutral forum for people to listen to different points of view and to engage in a search for common solutions. Trade and labour standards, HIV/AIDS and social responsibility, gender and trade, collaborating on non-communicable diseases, preventing and managing conflicts of interest on nutrition, and breaking the silos for disruptive action against hunger are examples of the issues that the GSO has taken on since its founding in 2004. The Management Committee has decided that it is time to move on, with confidence that the friends and supporters of the GSO will take the lessons learned from this collaborative experience in the multiple new directions that are opening up for transformative change today. The President of the GSO, Deborah Vorhies, (below with Katherine) welcomed participants to the celebration of the GSO mission on this special occasion. Throughout its existence, the GSO has facilitated cross-cutting approaches to dialogue and understanding of the many stakeholders involved in making a difference on global social issues. Participants are being invited to celebrate the GSO mission by engaging in a wrap-up dialogue to stimulate a reaffirmation and integration of this mission into their daily lives. 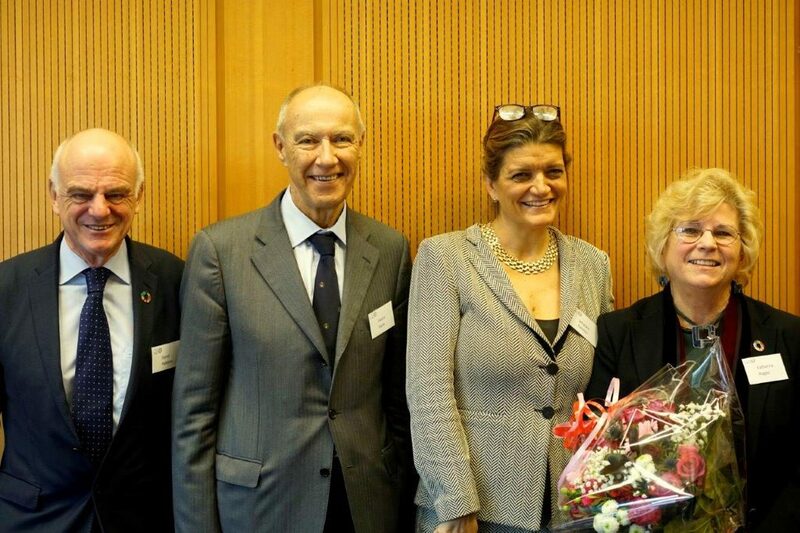 Ms. Vorhies then introduced three friends of the GSO who have supported the work of the GSO over the years – Francis Gurry, the Director-General of the World Intellectual Property Organization; Johanna Ralston, the CEO of the World Obesity Federation and former CEO of the World Heart Federation; and David Nabarro, Adviser on Sustainable Development and former Special Representative of the UN Secretary-General on the 2030 Agenda for Sustainable Development. Ms. Vorhies invited them to share their insights on the challenges and opportunities for cross-cutting collaboration in the future. The objective of this concluding celebratory event is to stimulate a discussion on how all of us might apply the lessons learned from the GSO to new forms of multi-stakeholder and multi-sectoral engagement. Francis Gurry, Director-General of the World Intellectual Property Organization, praised the GSO for its work and impact, filling a necessary space for taking us out of our silos. WIPO is an organization that enables innovation across so many areas – in health, climate change, food security, transport, communications – the list is all-encompassing. What is striking about today’s world is that innovation is accelerating at a faster rate than the world economy in general. WIPO’s latest report on innovation, for example, documents that the demand for patent applications in 2016 rose by 8.4 per cent; trademark applications rose by 12.2 per cent. WIPO reporting furthermore shows how the geography of innovation has been changing – with 47 per cent of all applications now coming from Asia. Competition is also intensifying around IP and innovation, with growing complexity in both the science of innovation and the architectural framework through which it is produced. Mr. Gurry then described some of the disruptive force of these trends. First to feel the disruptions of technological change and innovation have been the creative industries. Not only have they undergone complete transformation in the past decade or so, but the transformation has been driven by the private sector. So it isn’t public policy that has enabled the transformation, but the market, and policy has had to respond to these changes. Robotics and artificial intelligence are also under-going a revolution that is especially being felt in the world of work. How dramatic it must be that the WTO was established in the 1990s to open up markets through “off-shore” cheap labour for manufacturing of goods while the IP for these same goods was kept in industrial countries. The split worked reasonably well, but now the technology is shifting to bring manufacturing back into the industrial countries. And the life sciences, too, are undergoing radical disruptions with gene editing altering the fundamental nature of innovation. A similar impact is being felt in the field of energy. Concepts like technology transfer don’t belong to this age anymore. We are dealing with a speed of change and its impact on asymmetries that challenge us to think and act differently. Today, the US invests $520 billion in research every year. That is more than the individual GDPs of 167 countries. China, too, invests $400 billion in research. 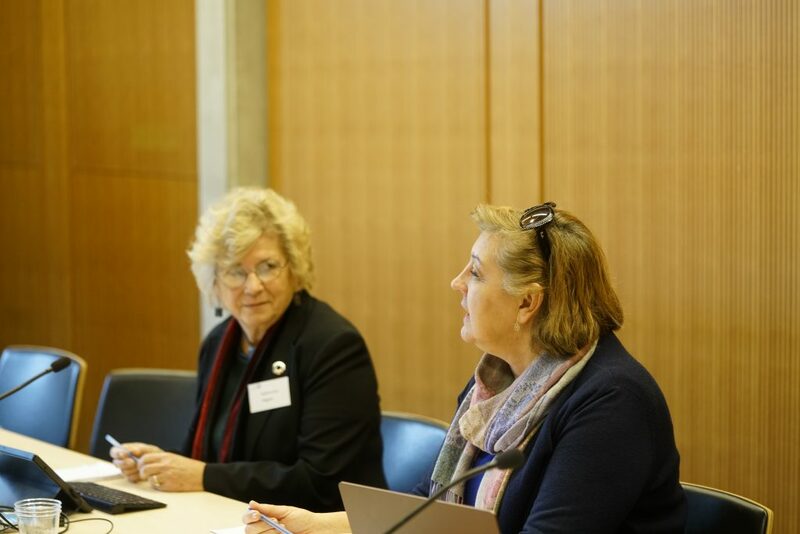 Johanna Ralston, the CEO of the World Obesity Federation and former CEO of the World Heart Federation, picked up on the message of the acceleration of change as it is being felt in the food systems of the world. Processed foods and broadening the commercial markets are bringing both good and bad outcomes. We are being challenged to act – to change our consumption patterns, but the words no longer serve to capture the narrative. Our intellectual framework does not work anymore. Lifestyle? We should banish the word. Social determinants of health? These are dry terms. We need a new narrative and the evidence to back it up. We need to find ways of talking TO the experience. The language matters. Malnutrition in all its forms, the diversity in the multiply layers of nutrition and the global food system are all critical drivers of our health challenges. The commercial side of the food system needs to be held to a heightened standard of responsibility in its marketing, but we also need to change the diversity of crops and the waste we create. We can’t do it alone. In our own lives, though, we need to get out of our comfort zone. We all need to be uncomfortable and brave enough to do this. It is this combination of the complexity and the personal that we need – to talk about how our own experiences apply to the situation, to us as human beings. In order to achieve the promise of the SDGs and to address the multiple interconnected challenges we face, we need a more accessible and integrated narrative, one which has the human experience at the centre as embodiment of multisectoral situations and solutions. Ms. Ralston closed her intervention by describing her own personal struggles and challenged us to do the same. David Nabarro, the former Special Representative of the UN Secretary-General for the Sustainable Development Goals, with extensive and pivotal leadership roles in health, food security and nutrition within the UN system, introduced the 2030 Agenda for Sustainable Development as the only comprehensive and inclusive plan that we have for the future. Putting it into context, he recounted the history of the eight Millennium Development Goals that galvanized us to concentrate resources where they could have the most impact. The experience led to the 2030 Agenda, giving us a “whole world” focus, thanks to the leadership of key countries like Colombia and Brazil, insisting on universality for the Post-2015 Development Agenda in the climactic hours of the Rio+ 20 Summit in 2012. The 17 goals of the 2030 Agenda are, therefore, based on five principles. They are people-centered, universal, interconnected, integrated and dependent on partnering. Building on the messages from Mr. Gurry on innovation and disruptive change and from Ms. Ralston on narrative, language and collective action, Mr. Nabarro emphasized that new ways of thinking are necessary for all of this to happen. It is a challenge of transformation. We need communities of transformative leaders, he said, to develop the skills, build the systems and trigger the synergy for a world of equity, fairness, health and peace. The GSO is a precursor for us to take on this challenge, and we urgently need to build such communities in order to achieve the ambitious goals and targets of the 2030 Agenda. We need a narrative for the future that works for everyone. Perhaps this is the 2030 Agenda, but competing narratives are undermining this – in the trade agenda and even in the environmental agenda, the narrative is too negative. We need a positive approach to harness and align these other agendas for a future that works for everyone. The block chain phenomenon is another example of a disruptive technology that is challenging the rules of innovation and IP. How can this be managed? How can the concept of a universal basic income be channelled into the future of work, letting people be the drivers of their livelihoods without work as the source of income? The complexity of the food system is distorted by the negative effects of fast food and especially on sugar as a pervasive ingredient in commercial food products. Should there be a convention on sugar much like the framework convention against tobacco? Should we be ending the damage of commercial farming by agribusiness and protecting local farmers instead? Increasing inequality in the world is a barrier to building communities of transformers. How can we deal with wealth distribution? It is a larger systems question – of the financial system versus the real economy. Lest we forget, there is also a dark side to our world. The new technologies and innovative forces are also being used for hacking, fake news and many other devious things. In spite of the systemic barriers, we need to recognize that consumption or demand side changes are needed to compel the changes we need in the system. A voice, a community, for example, is needed to mobilize and to have impact on this consumption/demand side. The GSO has helped us to realize that we don’t listen enough to each other. We need to cultivate a social dialogue that empowers the opposition to speak and be heard. Thanks personally to Katherine for building the trust among social partners at the ILO, even before she brought this to her work with the GSO. Social dialogue links us to all levels and interests in order to go to the core of the issue. There are new things happening that we can look to. Examples are drawn from the current African experience of innovation in the digital age – not just to leapfrog over stages of development but even to shift from purely economic development to human development. The transformational leadership should not just be concentrating on poverty reduction but rather on wealth creation. Stories and words are essential for the transformative narrative. We don’t have it yet for the SDGs. We need to change the people, but how can we reach them when we are using the wrong values? The 2030 Agenda is opening up a role for the private sector. The challenge for the private sector is to build trust. A flurry of systems can respond to the digital challenges of rapid technological change, and the issue for us is how to use this as an opportunity to channel new energies to the transformative pathways. Cognitive psychology identifies two types of drivers for change – positive and negative. It seems that negative drivers are more effective, but how can we deal with the systemic barriers to change? We may be ready for change in our individual lives but how should we deal with the barriers that we can’t control? Francis Gurry: Our existing IP system is based on transparency and public registers. The block chain phenomenon may be leading us to a parallel privatized system. And there is an enormous privatization going on of everything, including our development policies. There is a movement away from societal controls. To deal with this, the distribution of justice depends on our ability to manipulate higher social organizations. The heart of IP is balance between competitive advantage and transparency of the information underpinning that advantage. We invest in innovation to change the way things are. So we should focus on how social benefit can come from innovation – it must come from innovation. The dark side is indeed leading to greater vulnerability. We must recognize that the worst hackers today are governments. However, the characteristic of knowledge as a public good is the key. Johanna Ralston: The challenge is to find mutually supportive solutions. Tobacco is clearly separate from food since there is no redeeming benefit in tobacco. So we need to look at solving our food problems in a more inclusive way. A treaty on sugar? It would be better to consider a treaty on health. We should also be thinking about the narrative. In the climate change world, for example, the academic documentation is overwhelming but the Paris agreement was possible when the language and goals became more inclusive, accessible and persuasive. We needed more public consultation processes beyond the academic world to challenge these climate change myths. Shared ownership of the issues and solutions was helped by the papal encyclical on climate change, for example – all of a sudden a much broader community was engaged. How can we extend that example to the challenges in food, innovation and the SDGs that we are addressing today? Let us nurture the narrative. David Nabarro: In spite of the dark side, there is an overwhelming tide of goodness in our world. Most people want the best for the world and it is through this expression of humanity that goodness will prevail. We are challenged to identify with people’s expectations as they have identified them in the Sustainable Development Goals. It is our responsibility to make the 2030 Agenda the central framework for shaping the future of people and the planet. We should encourage collective mobilization through consumer pressure. Those of us who are committed to a sustainable future should align our efforts around the ground-breaking and comprehensive 2030 Agenda. We need to learn and embrace new ways of thinking and working so that communities of transformers emerge. The role of all of us is to find innovative ways to build coalitions of institutions and to curate communities of transformers. I believe that this is our destiny. Let’s get on with it. As the GSO Executive Director, I would like to thank the three presenters for their catalytic role in inspiring us – and linking their messages to the GSO vision. Francis Gurry’s longstanding support of our efforts and his appreciation for the cross-cutting impact of IP and innovation on global social issues have been reinforced by his insightful commentary on the dizzying speed and asymmetries of innovation today. Johanna Ralston has been an ally, especially as we have worked together in the GSO on NCDs and on building trust through transparency among stakeholders. She has inspired us with the challenge of complexity in developing a new narrative on nutrition and on personalizing our involvement while also working collectively. David Nabarro is the ultimate builder of coalitions. His charisma is drawn from a deep personal commitment and genius in transformative action. Thanks to him, we see the agenda ahead of us. Thank you also to the inspiration that came from so many of you when we established the GSO back in 2004. Our thanks especially to Brewster Grace from QUNO and Erfried Adam from the Friedrich Ebert Foundation who believed in the need for a place like the GSO and helped us get it started. Thanks also to Pierre Gheysens from Caterpillar, our first President, followed by Martin Watson from QUNO and Deborah Vorhies from ICTSD, who have supported this team effort through its many changes since 2004. Staffing came in the early days from Lucy Howe-Lopez, who was instrumental in getting the GSO started and joins us today as she has grown in her career to support Globethics, and from Susan Brown (who now serves on the Management Committee) and Michelle Botes, the best organizer one could have – and from dear friend Barbara Zolty, who was a key team player in our project on conflict of interest for the Scaling Up Nutrition Movement and who joins us here with her creative spirit. Other past and present Management Committee members are here to show their support, too – Mark Halle, Mireille Quirina, Julia Tainijoki-Seyer, Cécile Molinier and Kamal Gueye. It has truly been a team effort. And thanks to the ILO team here today, Anna Biondi, Franklyn Lisk, Alejandro Bonilla and Kamal Gueye; it was the ILO experience which was the initial inspiration for the GSO. Thanks especially to my partner of over 30 years Ralph Doggett who has been the backbone for the GSO and will continue to keep me on track, whatever that track might be. And thanks to all of you here today and others who could not join us but have participated so constructively in the work of the GSO over the years. It is your engagement that has produced the patchwork quilt that symbolizes the GSO mission – a quilt that is more than a final quilt but rather a fluid, constantly changing combination of pieces that come together in ever different patterns. Let us all take this quilt-making experience from the GSO and apply it wherever we go. See more photos of the event in the Gallery section of Katherine’s website.